Yesterday, the Utah Opioid Task Force held a meeting to discuss the opioid crisis in Utah and share resources to aid in the battle against addiction and overdose. Mark Jansen from the University of Utah David Eccles School of Business presented to the Utah Opioid Task Force on the indirect effects opioid abuse has on consumer behavior and finances. Some of the principal unseen effects of the opioid crisis are higher default rates and a raised cost of credit for consumers. Children are also highly impacted by opioids, addictions, and overdoses. Carrie Jensen from the CJC program and Allison Smith on behalf of Utah Alliance for Drug Endangered Children, presented on the high-risk children are at when their parents are suffering from an addiction to opioids. Every 15 minutes in the U.S., a child is born addicted to opioids. Additionally, not only do children do what they see, but drug-endangered children will struggle throughout their lives with emotional, cognitive, and behavioral problems. According to the latest statistics from the DEA, there were 4,714 opioid overdoses in 2018. Dr. Jennifer Plumb with Utah Naloxone stated that more people are surviving these overdoses due to Naloxone, prepared emergency rooms, and Utah Department of Health campaigns. Last month, the Task Force joined with the Uintah County Sheriff’s Office to launch an experimental program to supply Naloxone rescue kits to inmates upon release, and their close support network in an effort to increase needed supplies to those most at risk of an overdose. Midvale City Police Chief Randy Thomas and Utah CJC Director Tracey Tabet discussed a pilot program for screening processes that identifies children susceptible to addiction and helps them find help early on. Attorney General Sean D. Reyes discussed emerging technology that might be used to fight the opioid crisis. The Utah Opioid Task Force is dedicated to combatting the opioid epidemic in Utah and works in collaboration with groups nationally and across the state to address the effects of opioid addiction. You can help combat the opioid crisis by steering clear of opioids, getting rid of unused meds, reaching out if you or someone you know is suffering from opioid addiction, learning to recognize an overdose, and learning how to use a Naloxone kit. Learn more here. 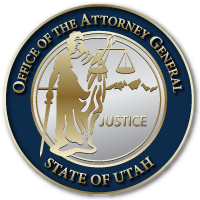 This entry was posted in Recent Posts and tagged Opioids, Utah Attorney General's Office, Utah Opioid Task Force on March 20, 2019 .